DELUXE EMERALD BAY CONDO NOW BOOKING FOR 2019 AND BEYOND! PRIME 2019 DATES OPEN BOOKING 2019 DATES AT 2017 RATES! RIGHT ON THE SHORES OF TABLE ROCK LAKE WITH ON SITE MARINA. LOCATED ON BEAUTIFUL EMERALD POINTE ON TABLE ROCK LAKE AND JUST MINUTES FROM ALL THE ACTION OF BRANSON ! Our condo is very clean and well appointed. Located in a gated community on Tablerock Lake's beautiful Emerald Pointe. Beautifully decorated throughout; fully-equipped kitchen; dishwasher, full size refrigerator, glass top range, microwave, washer and dryer. Large dining area plus breakfast bar with bar stools. The screened/glasses all weather sun porch is carpeted and has patio furniture to enjoy your leisure time. We are offering a deluxe 3 bedroom/3 bath condo. Our condo has all the comforts of home. The bedrooms have a dresser and/or chest and flat screen cable TV's in the living room and all 3 bedrooms; some with DVD. The master bath has a jetted tub. There is a queen sofa sleeper in the living room. The condo has a dining room, fully equipped kitchen with washer and dryer, living room and glass/screened-in all-weather porch/sun room with patio furniture. The living room has a large flat screen TV with DVD player. Located on the shores of Table Rock lake on Emerald Pointe. We have a new swimming pool as of May of 2018, we are only 50 yards or less from Tablerock lake, with a full service marina (Branson Bay Marina) and convenience store just 1/2 block to the west. A fishing, boating and water sports paradise. We are also conveniently located close to all Branson attractions including Silver Dollar City, White Water Park, Showboat Branson Belle, Branson Landing, shopping centers, shows, restaurants, marinas, Tablerock Lake Dam and fish hatchery to name a few. It's a great location for any of your vacation plans, there is something for everyone. This is a single unit that can be rented as a two or three bedroom, it will not be rented to more than one group at a time. PRIME 2019 DATES AT 2017 RATES!! LAKEFRONT CONDO WITH AN ONSITE MARINA! There will be additional charges for any guest bringing a boat. We usually rent full weeks Sat-Sat or Sun-Sun from mid June to mid August. In the summer we only book weekends when one guest checks out on a Thursday or Friday and the next guest does not check in until Sunday. There is a one time cleaning fee of $90 to be left in the condo at check out, cash or check is acceptable. The location is perfect. We are a gated community right off of two of the alternate traffic relief routes (Hwy 165 & Hwy 265) so you can get anywhere in Branson quickly. It is a gated community located between the Tablerock Lake Dam and Highway 65 so we have easy access to all the attractions yet we are right on the shores of the clear water of Table Rock Lake. It is a quiet area to relax but all the attractions of Branson are only minutes away. We are so close to the Lake, the water is only 50 yards in front of the condo building. We have an on site swimming pool, tennis courts, weight & exercise room, and a marina with a convenience store less than a half of a block away. The grocery store is only 5 minutes away at the Southtown mall. We have very little traffic on the land or the water. We are a gated community so the amenities offered are strictly for our guests and resident use only. Fabulous scenery to enjoy; you won't believe that all the attractions of Branson are just minutes away. A wonderful place to return to rest after a day of site seeing, shopping or boating. Thanks, Sandy! 3 Full Bathrooms with plenty of towels and wash cloths. We furnish hand soap, body wash and shampoo. Glass top range with full size oven. Full size kitchen appliances including refrigerator, range, dishwasher, washer & dryer. Fully equipped with pans, dishes & utensils to make meals in the condo, also a toaster, coffee maker & blender. large flat screen TV in living room plus 32" flat screened TV's in bedrooms mounted to the wall. (4) Condo has cable TV with TV's in living room & bedrooms. DVD and/or VCR players in the living area. Can be rented from the on site marina. Condo has glass/screened-in porch sunroom on the lakeside. There is a concrete patio on entrance side. Located on Table Rock Lake, only 50 yards to the water. Branson Bay Marina at Emerald Pointe is on site within 1/2 block of the condos with valet boat service and courtesy docks for boats. They have rentals for boats, wave runners, paddleboards, kayaks, canoes, skis, tubes and wake and surf boards. They have a newly remodeled convenience store with bait, snacks, ice cream, souvenirs, t-shirts, restrooms, tables & chairs to enjoy a sandwich, cold drinks, bagged ice, milk, bread, etc.... Rent boats from our on site marina see bransonbaymarina.com. Also, State Park Marina and Bass Pro Long Creek Marina are only 3-5 miles away and offer boat rentals. Property was outdated and very loud. The beds were uncomfortable and noisy. Other than that it was fine. Resort was very peaceful and in a great location. Rooms had everything that you could possibly need and then some. We will definitely be back again. Sandy is such a nice lady. The condo was very clean. Lots of room for our family of 9. I really loved our neighbor he is so nice and awesome. Great place to visit. Had a great time. Great people here too. Our family was in town moving our son into one of Sandy's units for a summer internship. We were pleasantly surprised as we had no idea what to expect. The location on the lake is absolutely beautiful and Sandy was more than accommodating during the whole move-in process. She spent the majority of the day with us getting us acclimated to the area, as our son was going to be there for an extended stay. She also put my wife, son, and I up for the night in one of her other units prior to our drive home. All units we stayed in and saw were extremely clean, in good repair, and very inviting. We will certainly look Sandy up for any of our future stays in the Branson/Hollister area!! Having lost our matriarch this summer, our family wanted to do something non-traditional for Thanksgiving this year. We rented two condos at Emerald Point and besides having time together we participated in some of the events Branson has to offer. We came from several parts of Missouri and from Colorado. The condos are located far enough away from the "76 strip" traffic and yet easy enough to get to that area if we wanted to. The view of the lake and the close by trees satisfied our love of nature. The condos were roomy and provided space for privacy if we chose that. 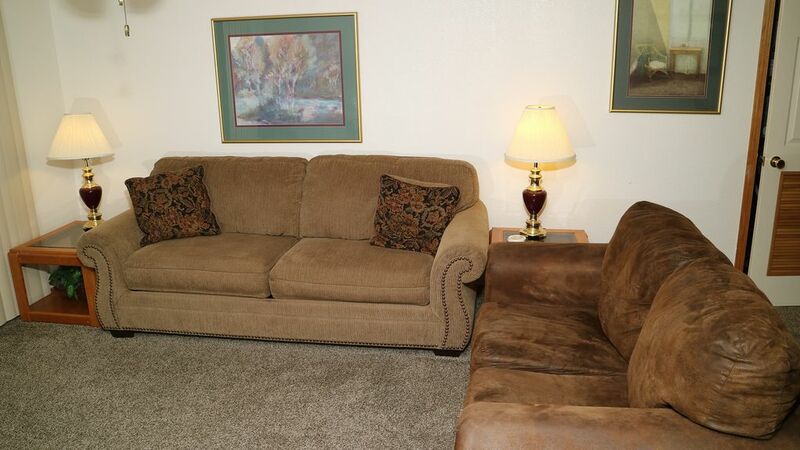 They were very clean and maintained with nice furnishings. The individual cost per night was much cheaper than renting a hotel and we were able to do most of our own cooking so we could all be together and not have to wait in line to get tables close by each other at a restaurant. Sandy was great to answer our many questions and work with us to have our needs met. We loved the whole experience. The condo was fine, perfect for our family. Adequate kitchen, 3 bedrooms, 3 baths - very clean and comfortable. Our only surprise was that the vertical blinds were badly needing to be replaced. We had to "patch and rehang" several times because some slats were broken at the top and fell when the blinds were pulled. Other than that, it was totally a great experience - we will consider staying there again. Thank you, Sandy - you were great to work with! We are located on a cozy cove at the Emerald Bay Yacht Club on Emerald Pointe. As you travel down the hill the view is absolutely stunning. The scenery on Emerald Pointe is fabulous especially at sunset when the sun reflexes off of the lake. You won't believe that all the attractions of Branson are just 10-15 minutes away. Some of our favorite places to visit are Silver Dollar City, Branson Landing, the Fish Hatchery, The Visitors Center by the Table Rock Lake Dam, Dixie Stampede, Grand Country Shows and the Six Show. You will be sure to find your favorite as there are literally hundreds of places to visit in the Branson area. We also love to boat and fish. Emerald Pointe has an on site marina with boat rentals, fishing licenses, boat launch & convenience store within 75 yards of the condo. Each complex has their own pool plus Emerald Pointe has a clubhouse with a pool and an exercise room. You will run out of time way before you run out of fun things to do. There will be additional charges for any guest bringing a boat. We usually rent full weeks Sat-Sat or Sun-Sun from mid June to mid August. We will also book Sun or Sat to Fri or Sat on the 6 night minimum. If someone checks out on a Friday and someone else checks in on a Sunday, then we would book a 2 night weekend, otherwise we don't just book weekends. There is a one time cleaning fee of $85 to be left in the condo at check out, cash or check is acceptable. A VISA or MasterCard serves as your damage deposit.